Featuring a unique combination of five active ingredients, UltraShield® Red equine fly spray offers broad-spectrum control for killing flies, mosquitoes, and ticks. While you’re likely most concerned about controlling flies, ticks, and mosquitoes, UltraShield® Red Insecticide & Repellent also helps you control a host of other bothersome pests, including gnats, midges, punkies, no-see-ums, chiggers, and fleas. 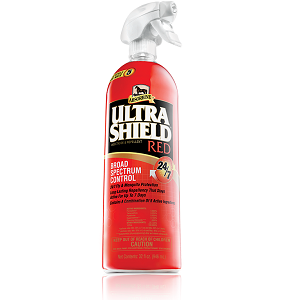 Use UltraShield® Red as a premise spray, and you can add four common types of cockroaches to the list, as well as carpenter ants.